This page will contain all the details on the PINCH POT project. 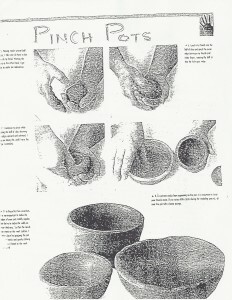 Pinch pots may be the original form of pottery. This is the process of building a pot with no tool except for the human hand. Assignment: The student will create 2 pinch pots of different sizes and shapes using the optional decorating technique of incising. Wedging: The process of aligning the clay particles and removing air from the clay. Plastic: Clay that is moist and easily shaped and modeled. Leather Hard: Clay that has begun to dry but still retains moisture. The perfect state of clay for finishing techniques. Incising: The process of cutting, fluting, scraping or altering the surface of the clay while in the plastic or leather hard state. Wedge 1 pound of plastic clay. Rewedge if air pockets are present by cutting it in half. Return to your table. Shape equal halves of clay into a ball and push thumb into the center of one half of the clay until almost to the bottom. With thumb inside clay, begin turning ball of clay and pinching thumb and forefinger together. Please be cautious of the thickness of the clay between your fingers. Continue to turn and pinch, working your way around the ball and then up towards the opening at the top. Using a tool shape and smooth the inside and the outside of the pot. Use tools to shape and finish the edge and the bottom of your pot. When clay is leather hard begin using tools to add your design to the outside of the bowl using incising. Refer to your drawing. When design is finished, let bowl sit out uncovered to get to Bone Dry. Turn in for bisque firing. DUE DATE: _________________.